So, the OnePlus 5 is going to launch on 20th, and there are a lot of things that we already know about the phone, from official as well as non-official sources. Yesterday, we came to know that the phone has 8GB of RAM and octa-core 2.3GHz Qualcomm Snapdragon 835 processor. And today, OnePlus posted a new image on its social media pages that show the rear of the smartphone with dual camera setup on the back. 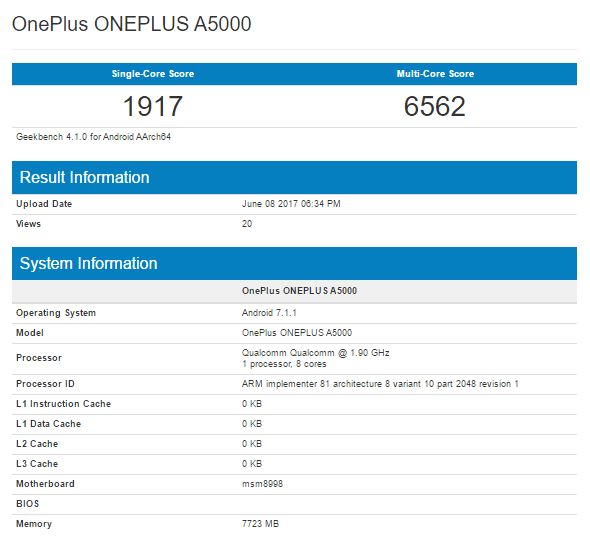 Today, the phone was spotted on benchmarking platform, Geekbench that reveals the score of the device. So, let’s see how the scores are when we compare them with those of the latest premium phones if this year. So, the OnePlus 5 is indeed coming with Android 7.1.1 Nougat out of the box, Qualcomm Snapdragon 835 processor and 8GB of RAM. So, nothing surprising regarding the specifications. Now, coming to the Geekbench scores, the phone scored 1917 on Single core whereas 6562 on Multi-Core. These scores are better than the scores of HTC U11 and almost same as that of the Xiaomi Mi6 and Moto Z2 (the Moto Z2 scores were revealed yesterday). The scores are pretty close to that of Galaxy S8 that show that the OnePlus 5 is going to be one of the most powerful Android smartphones of this year. So, what are your views? Do let us know via the comments section.